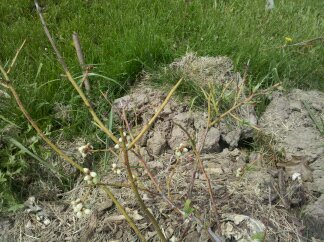 We continue to amend the soil around our blueberries with acidic water. I cannot believe how well one in particular is doing. We brought it from Michigan where it sat on our deck all spring. It then sat on our deck all winter in Illinois. Just look at it go! The Aronia are all doing well. I sprayed the one furthest to the east with my “Deer Be Gone” spray and it seems to be doing the trick. The autumn olive plants still seem small. I’m not really sure how much they are growing because they were so small to begin with. All of the sites calling them an “invasive weed” may have played them up too much in my mind. 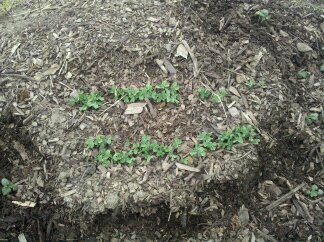 There are two hops sprouting and getting bigger daily. Our kiwi just had a major growth spurt and seems to be training on the wire we put up. Our grapes are also budding…can’t wait to see what they do this year. We put fencing around each tree today to keep the deer at bay. The weeping mulberry tree is budding up, but the Illinois Ever bearing and the apple tree aren’t doing too much yet. I actually found where some of my leeks are growing. It looks like they have been for some time. 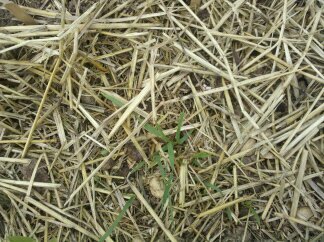 I must have missed it under the mulch but it is popping through. 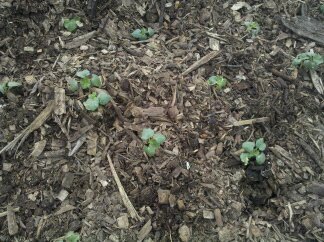 I planted okra today in the same bed I put my salad and spinach in (East bed). The okra we got from the nursery at Big R. We grew some from seed in 5 gallon buckets last year and got enough to fry up. It was pretty tasty so I’m hoping we get quite a bit more this year. We also bought some pepper and tomato starts from Big R. We got three heirloom tomatoes, cherry tomatoes and cherry peppers. I have not yet given up on the tomatoes and peppers I started. I just want to have back-ups, and really, is there such a thing as too many garden tomatoes? I planted the cherry peppers yesterday and plan to get the tomatoes in the ground by the end of the weekend…probably unrealistic but that’s the plan. We are making our own cages…more on that later. 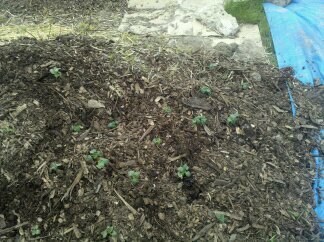 My peas are looking strong and are a vibrant green. I can’t wait until they are ready to eat! These were planted from seed on 4/29. I started a little kitchen garden of herbs and lettuce to the west of our back deck a few weeks ago. A cement patio used to be there but we busted it up and hauled the concrete out so we could get in to fix a leak in the foundation. We built up the grade around that area with a bunch of topsoil. I planted in that topsoil and mulched the small square where I planted. 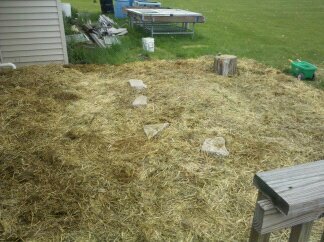 Today I grabbed three bales of straw and mulched the entire area. 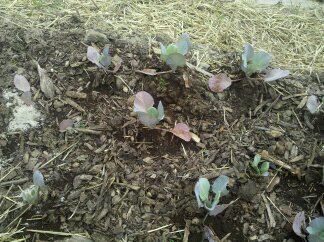 I’m expanding my kitchen garden with more herbs and lettuces. We picked a few concrete pieces and made a little trail around the plant area. Looks cool doesn’t it?